Mark Kimball, CEO of Erlanger Western Carolina Hospital (EWCH) presented North Carolina Governor Roy Cooper with a resolution “urging the North Carolina General Assembly to expand Medicaid in North Carolina as soon as possible” at a roundtable discussion at the hospital on April 11. “Across North Carolina, 40 percent of rural hospitals are operating with budget deficits and four have closed since 2014,” said officials with Governor Cooper’s office. 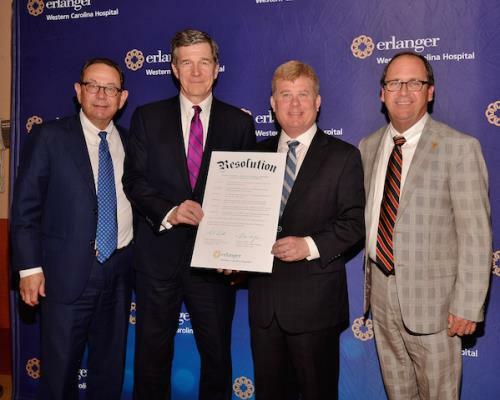 Erlanger’s resolution highlights the challenges rural hospitals face, including estimates that it costs EWCH more than $17 million per year to treat uninsured patients. Erlanger officials were joined at the roundtable discussion by other hospital and community leaders as well as Pastor Tim Huff from Murphy Free Methodist Church, Tom O’Brien, president and CEO of Industries Opportunities, Inc., and Dr. Brian Mitchell from Peachtree Community Health Center.